Ambient The surrounding or encompassing atmosphere. Annealed Glass Manufactured by pouring molten glass onto a bed of molten tin which is then cooled, annealed glass is the product that most people think of as “plate” glass. This flat glass product has little residual surface compression and must be handled with care to minimize thermal stress. It breaks into sharp shards when shattered. Art / Opalescent / Cathedral Glass Colored translucent glass, often called art glass, opalescent glass, cathedral glass or stained glass, is also produced by the rolling process, but generally in small, batch type operations. There are usually variegated colors within each sheet produced and no two sheets will match for hue. Thickness will vary within a sheet as well as from sheet to sheet. The maximum thickness produced is usually 1/8″. When used as a glazing material, art glass should be glazed in the same manner as tinted / heat absorbing glass. Art glass cannot be tempered. Attachment Systems Chemical or mechanical restraint systems that improve the performance of security window film during blasts, high winds and smash-and-grab break-ins. Blast A temporary change in the gas density, pressure and velocity of the air surrounding an explosion point. If the initial change is discontinuous, it is referred to as a shock wave. If the initial change is gradual, it is known as a pressure wave. Blast Over-Pressure The violent rise in air pressure above normal atmospheric pressure (14.786 pounds per square inch). BTU (British Thermal Units) British Thermal Units are the amount of heat required to raise the temperature of one pound of water one degree Fahrenheit (1 BTU = 252 Calories). Clear Glass Clear glass consists of silica sand with added alkaline salts such as lime potash and soda. It is colorless and has a visible light transmittance ranging from 75% to 92%, depending upon thickness. It constitutes the bulk of the flat glass that is used. Daylight Application (Installation) The process of applying window film to a piece of glass from edge to edge. A small untreated area of glass remains, which is referred to as a “daylight gap”. Drag (Suction) The negative pressure effect felt on the roar face of a structure as the blast wave moves away from the building. Emissivity The ratio of radiant energy emitted by a surface to the radiant energy emitted by a black body of the same temperature. Explosion A sudden release of energy resulting in a blast wave. Figured / Patterned Glass Figured / patterned glass is produced domestically by the continuous pour process in thicknesses of 1/8″ to 7/32″. A pattern etched on one or both of the rollers is reproduced on the glass. Colors are available but are extremely limited. This type of glass is frequently called “obscure” or “decorative” glass. The pattern diffuses detail of objects viewed through the glass, it does not obscure them. The degree of diffusion achieved is a function of the pattern and whether the pattern is on one or both sides. Some patterns cannot be tempered for safety glazing use because of their depth. Float Glass The float glass process accounts for over 90% of the flat glass presently produced in the United States. In this process, molten glass is poured continuously from a furnace onto a large bed of molten tin. The molten glass literally floats on the tin, spreading and seeking a controlled level in the same manner as water poured onto a smooth, flat surface. In the controlled level seeking process, the molten glass is allowed to spread to width of 90″ to 140″, depending upon the furnace size and glass thickness being produced. The glass slowly solidifies as it travels over the molten tin. It is then cooled under controlled conditions. Afterward, it emerges as a continuous ribbon of glass at essentially room temperature. The product is now flat, fire-finished, and with virtually parallel surfaces. Ground Zero The location at which an explosion occurs. Heat Strengthened Glass Heat strengthened glass is fabricated by a process similar to that of tempered glass. Some equipment can produce both. The glass is heated to approximately 1100° F and the cooling process is slower than for tempered glass. The strength developed is about twice that of annealed glass. Hot Spots Areas particularly affected by solar radiation and the imbalance of solar energy. Impulse The amount of energy generated in an explosion. It can be either positive (impact force) or negative (suction force) energy. Impulse is measured by integration of the pressure / time curve recorded in an explosion. Insulated Glass Double insulating glass units consist of two panes of glass that enclose a hermetically sealed air space. The panes are held apart by a spacer around the entire perimeter. The spacer contains a moisture absorbent material called a desiccant that serves to keep the enclosed air free of visible moisture. Laminated Glass Laminated glass consists of two or more plies of glass interleaved with clear or tinted polyvinyl butyl (PF). The application of heat and pressure bonds the glass and plastic interlayer into one unit. When laminated glass is fractured, the particles of glass tend to adhere to the plastic, affording protection against flying or falling particles. Some combinations of glass and plastic thicknesses do qualify as safety glazing materials under the criteria of ANSI Z97.1-1984 and CPSC 16 CFR 1201. Lite A sheet or pane of glass. Low-Emmissivity Glass Low-emissivity coatings (Low-E) reflect that part of the heat spectrum above 3000 millimicrons wavelength that is called “sensible heat”. The heat from hot water or steam radiators and the heat from hot air ducts from a furnace are typical examples of this kind of heat. These coatings have high visible light transmission. In fact, they are nearly invisible on the glass. The visible light transmission is typically about 20 percentage points below that of an equivalent uncoated glass. The major attribute of Low-E insulating units is their sensible heat reflecting character which is apparent from their low U-values. Low-E coatings are applied to glass by vacuum processes and by pyrolitic processes. Luminescent Coefficient The rate of visible light transmission and shading co-efficient (Ke ratio). This is a relationship between how much heat gain is rejected and the amount of visible light transmittal. Mirrors Most mirrors are manufactured by the wet chemical deposition method, although a few, for specialized use, are made by vacuum deposition. Safety mirrors are available to meet various laws and building codes. A mirror made from tempered glass will have the inherent distortion from the tempering process and cannot have the same quality in reflection as laminated ones made from mirror quality annealed float glass. Transparent, or two-way mirrors, are designed to allow vision through from one direction while presenting a mirror appearance from the opposite side. Their major application is to permit undetected observation for study or surveillance in places such as prisons, gambling casinos and psychiatric treatment centers. A difference in lighting level is necessary; in the room to be studied the lighting level should be at least five times greater than the lighting level in the observation room; ten times greater is even more effective. Two way mirrors are not intended for use in exterior walls. Negative Phase The portion of a blast wave, also known as “suction phase”, whose pressure is below ambient. Pane A glass-filled division of a window, door or wall, or the glass itself. Plate Glass Plate glass, manufactured by the grinding and polishing process, is no longer produced in the United States, and words referring to it have been eliminated from the ASTM Specification C103685. It has been replaced by the float glass process. Positive Phase The portion of a blast wave whose pressure is above ambient. Reflected Pressure The amount of pressure felt by an object standing directly in the path of an expanding blast wave. Reflective Glass Reflective glass is a clear or tinted glass coated with an extremely thin layer of metal or metallic oxide. Rolled Glass The rolled glass process consists of pouring molten glass from a furnace, then feeding it through rollers to produce the desired thickness. The glass ribbon is then cooled under controlled conditions. There are three general types of rolled glass: figured / patterned, wired and art / opalescent / cathedral glass. Shading Coefficient (SC) The ratio of solar heat gain passing through a glazing system to the solar heat gain that occurs under the same conditions if the window were made of clear, unshaded, double strength window glass. The lower the number, the better the shading qualities of the glazing system. Sheet Glass The Sheet glass process accounts for a very small portion of U.S. glass production. Some imported sheet glass will continue to be used, mainly in thickness of 1/8″ and less. Side-on Pressure The pressure felt on the sides and top of an object as the blast pressure wave envelops and passes over and around it. Sill The horizontal structure that supports the upright portion of a window frame. Spandrel Glass Spandrel glass panels are heat strengthened or tempered glasses with a ceramic frit color permanently fused to one of the surfaces. Glass in spandrel areas is not subject to corrosion as are some other spandrel materials. Pleasing aesthetics and economies can be obtained using a single framing system for an entire wall. Glass spandrel panels can also save energy when insulation is placed behind them. Standoff Distance Generally speaking, the further you are from a blast, the better your opportunity to survive. Each site should be evaluated to assess its structural strength, window frame type and attachment, and glass type to determine which style of film application would be most appropriate to withstand the blast at a given distance. Tempered Glass Tempered glass is fabricated by subjecting annealed glass to a special heat-treating process. The most commonly used process is to heat the glass uniformly to approximately 1150° F, and then rapidly cool it by blowing air uniformly onto both surfaces simultaneously. The cooling process locks the outer surfaces of the glass in a state of high compression and the central portion, or core, in compensating tension. The color, clarity, chemical composition and light transmission characteristics remain unchanged. Likewise, compression strength, hardness, specific gravity, expansion coefficient, softening point, thermal conductivity, thermal transmittance and stiffness are unchanged. The only physical property that changes is tensile or bending strength. Under uniform loading, tempered glass is about four times stronger than annealed glass of the same size and thickness, and is thus more resistant to thermally induced stresses, cyclic wind loading and hail stone impacts. When broken, tempered glass breaks into a multitude of small fragments of more-or-less cubical shape. Therefore, it qualifies as a safety glazing material under the criteria of Federal Standard 16 CFR 1201 and the American National Standards Institute (ANSI) Z97.1-1984, when so labeled and certified. Spots or blotches may, at times, be visible on tempered glass, especially when viewed through polarizing lenses or in certain types of reflected light. The intensity will vary with lighting conditions and viewing angle. This is caused by the strain pattern induced during the cooling stage, and is not inherently a cause for rejection. Thermal Stress (1) All glass absorbs energy when exposed to solar radiation. (2) Tinted glass absorbs more energy than clear glass. (3) Occurs when there is a temperature differential between center of glass and shaded edges. (4) The ability of the glass not to break is determined by its edge strength. Tinted / Heat Absorbing Glass Tinted or heat absorbing glass is made by adding various colorants to the normal, clear glass batch to create a desired color. The four colors available by the float process are bronze, gray, green and blue. Visible light transmittance will vary from 14% to 83%, depending upon color and thickness. The color density is a function of thickness, and increases as the thickness increases; visible light transmittance will decrease as thickness increases. Tinting reduces the solar transmittance of glass, has little effect upon solar reflectance, and hence increases solar absorption (heat). This explains why heat strengthening or tempering is sometimes required for the thicker tinted glasses. Adding a metallic coating also has the same effect on thinner glasses. TNT Equivalence The quantity (Ib / kg) of an explosive material expressed in terms of the equivalent mass of TNT required to generate similar blast values. Total Solar Absorption The ratio (percentage) of the total amount of solar energy that is absorbed by glass compared to the amount of total solar energy that hits the glass. This solar energy is neither transmitted through the glass nor reflected back out into the atmosphere. Transmissivity The amount of radiant energy transmitted from a radiating object through the atmosphere to a target after reduction by atmospheric absorption and scattering. U-Value U-value measures the heat transfer that occurs through the inside and outside surfaces of glass. The U-value is a function of temperature and is expressed in BTUs (sec definition) per square foot per hour per degree Fahrenheit (BTU / sq. ft. / hr. / F°). 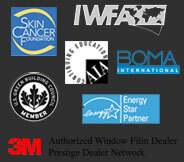 Better insulation systems, including window film, have lower U-values. Ultraviolet (UV) The damaging portion of the solar energy spectrum that causes fading and deterioration to fabrics, furniture and furnishings. UV rays also age skin and cause skin cancer. Ultraviolet (UV) Inhibitors Chemical and material elements added to products such as window film and lotions to block and / or filter out varying amounts of harmful UV rays. Visible Light Reflectance The percentage of total visible light that is reflected by glass and that can be seen. Wet Glaze The application of silicone sealant or similar liquid-state material around the perimeter of the glass, e.g., a bead of silicone mastic used to bond the film to the glass to the window frame. Wired Glass Wired glass is produced on the same equipment as figured / pattered glass. A welded wire netting or parallel wires are introduced into the molten glass just before entering the rolls to embed the wire into the glass. Patterned wired glass has a pattern on one or both sides, and is sometimes called “rough” wired glass. Polished wire glass is produced by grinding and polishing rolled wired glass blanks. Tinted / heat absorbing wired glass is available only as an import. The heat absorbing characteristic in conjunction with the normally poor cut edges and the wire netting can cause a high rate of breakage from thermal stress, especially in non-vertical applications. The major uses of wired glass are in institutional buildings and fire rated windows and doors. All wires must be completely embedded in the glass. Some misalignment of the wires may be noticeable, but this is not considered cause for rejection. Wired glass cannot be tempered.